NatureWorks is a non-profit Tulsa organization which assists in the development and conservation of wildlife preserves, introduces wildlife into new habitats, and provides education opportunities for adults and children on the values of sharing our homeland with wildlife. Every year NatureWorks honors an organization or indivdual for significant contributions to nature conservancy with a bronze monument. Thus far there are 18 of these handsome monuments mostly located over the length of the Riverpark. This monument is "Mallards" and is dedicated to Ducks Unlimited. These are very handsome bronzes and I will try to feature more of them as time goes by. For a list of all the NatureWorks Monuments to date and a key to their location see their web site HERE. 4070 Southwest Boulevard, Tulsa, Oklahoma, "Red Fork"
Ollie's Station is a old fashioned diner in a part of West Tulsa known as Red Fork. 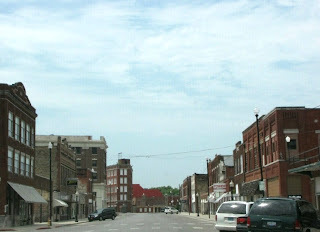 This is one of a number of small communities that have been absorbed as part of the city of Tulsa. The famous Route 66 ran through east Tulsa on 11th Street and on to the west on what is now Southwest Boulevard. 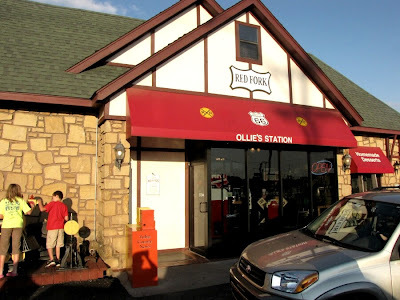 Ollie's Station is owned by Joe Gilling who collects model railroads. His large collection is on display in the restaurant. 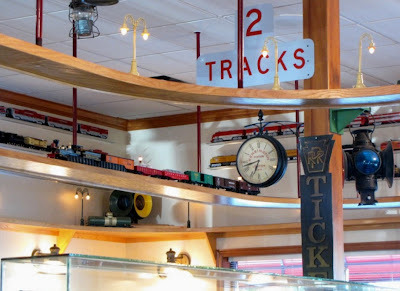 Tracks for several gauges of model train are laid out on shelves on several levels around the restaurant. 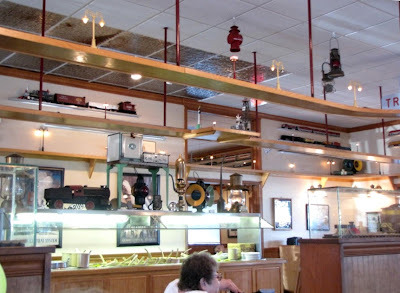 Different trains run around for the entertainment of diners. Molly and Willy were fascinated by all the trains as we were. We also really enjoyed the food. I had the chicken fried steak and it was perfect. We came because of the trains, but we will return for the food! Our food is cooked and seasoned like Mom and Grandma would prepare it. We have a comfortable "mom and pop" atmosphere. The old cafe style is enhanced by the railroad motif. Ten running trains, from G-scale to Z-scale, run the length of the dining room and through scale model cities and towns. 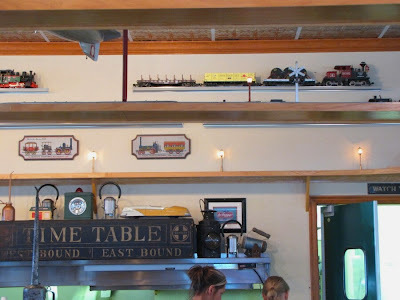 Our walls and shelves abound with railroad memorabilia. 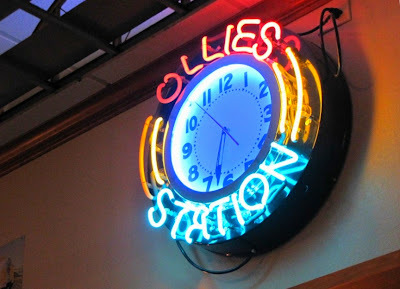 Ollies is located in old downtown Redfork on a corner that's been here since 1894. Railroads, oil wells, and the famous Route 66 all merge at Redfork Corner to give young and old a touch of history and some of the best food in Oklahoma. 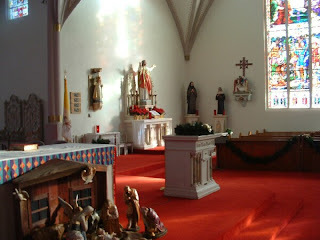 Immaculate Conception Catholic Church in Pawhuska, Oklahoma is known by many as "The Cathedral of the Osage." Perhaps it has been given this title not only because of its large cathedral-like appearance, but also because of its importance in the life and history of the Osage. It was in 1673 that Father Jacques Marquette, the great French missionary and explorer, came unexpectedly upon a band of Osage Indians in what is now the state of Missouri. In the years that followed, many other Jesuit missionaries, known as "black robes", visited the Osage villages, introducing them to the Christian Faith. In 1847, Father John Shoenmakers established a permanent mission and schools for the Osage at what is now St. Paul's, Kansas. Known as the "Apostle to the Osage," Father Shoenmakers worked for some 36 years among the Osage until his death in 1883. By that time the Osage had been moved southward into Indian Territory or what is now Osage County in the State of Oklahoma. Immaculate Conception Catholic Church was established in 1887 to serve the Osage Catholics of Pawhuska. The present Gothic-Style brick church is the third church built by the parish. Begun in 1910, it was not completed until 1915. The original plans for the church was to have large stained glass windows, but the First World War delayed those plans. The windows, built by craftsmen in Munich, had to survive WW I before being shipped to Pawhuska in 1919. Twenty-two windows made in Munich, Germany adorn the walls of the church today. Two large windows on opposite ends of the transept measure 9 feet across and soar 36 feet high. The north transept window is known as the "Osage Window." It depicts the early missionary Father Shonmakers with a band of Osage in authentic Osage dress. 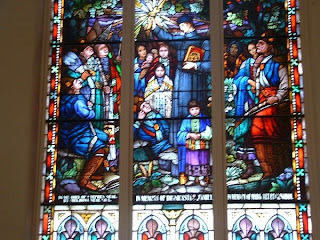 The window on the south transept depics Christopher Columbus and the Spaniards firs encounter with the Native Americans. Other windows depict Biblical figures and scenes. Pope Benedict XV granted a special request for Osages to be immortalized in the windows. 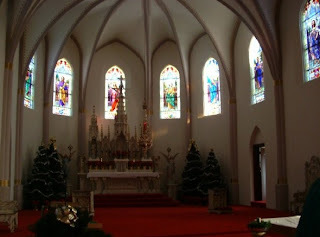 Only bible scenes are portrayed in Catholic Church windows and Pawhuska’s Catholic Church is the only church in the world to have anything different. 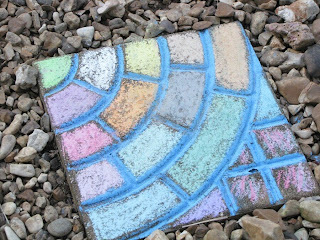 To view more of the magnificent stained glass windows, look HERE. The quality and beauty of these windows has been widely praised. 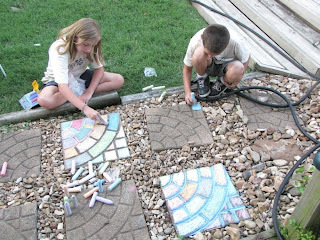 Their artistry and detail is truly exceptional. 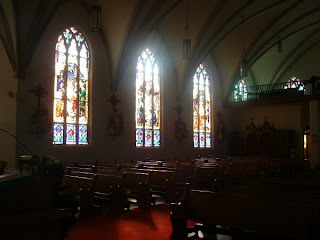 Each year visitors of all faiths visit Immaculate Conception as a historical monument of the Osage, and to view its beautiful windows and interior. Today, Immaculate Conception continues as a living and active parish of 140 families, most of whom are Osage. In looking for information for this post I ran onto some interesting things. If you find the history of these people intriguing you will enjoy the Osage News. Look HERE. 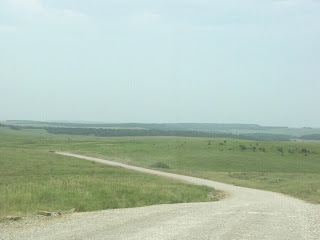 The Tallgrass Prairie is located just north of the community of Pawhuska. 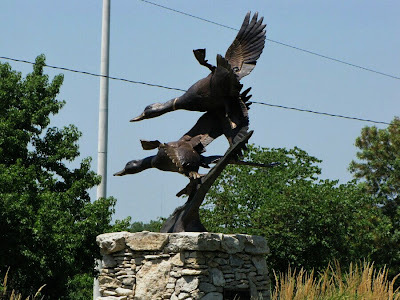 The town began in 1872 when Osage Agent Isaac T. Gibson established the Osage Agency on Bird Creek in what was then the Osage Nation, Indian Territory. Pawhuska was the scene of public lease auctions during the Osage oil boom of the 1910s and 1920s. The auctions were attended by oilmen, including Frank Phillips, Lee E. Phillips, Waite Phillips, William G. Skelly, and Ernest W. Marland. In 1920, near the peak of Osage oil-field production, Pawhuska had a population of 6,414. The Atchison, Topeka and Santa Fe Railway was extended from Owen in Washington County, Oklahoma, to Pawhuska in 1923. In these early days when the oil boom was in full swing and the great depression a decade in the future the city was expected to grow rapidly and the downtown area was built to accomodate that expectation. This was to be the peak of the city's population. The population was 3,629 at the 2000 census. 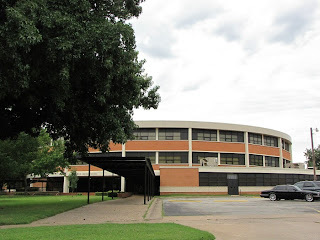 There is a detailed and very interesting history of Pawhuska and Osage County from which I borrowed a few items. It was written by Jenkin Lloyd Jones whose family owns the Tulsa newspaper. It is too long to include here but is well worth reading. You can find it HERE. As an example here is the origin of the name Pawhuska. Pawhuska - The name means White Hair; it was given to Osage Chief Paw-hiu-Skah (spellings vary) after he took part in a battle in Ohio against American troops during the Washington administration. He tried to scalp a fallen officer, only to have the officer's white hair (a powdered wig) come off in the chief's hand. Aided by the diversion, the officer escaped. The chief thought the hair had great power - it had helped protect its wearer - and kept the wig with him for the rest of his life, taking the name White Hair as a result of his experience. Speaking of information, look at the Osage Nation section of the Oklahoma Byways site, found HERE. In the town center is a handsome 5 story triangular building which resembles the famous Flatiron building located in Times Square in New York City. As early buildings in Pawhuska were constructed, a triangle-shaped piece of land was left in the middle of town. It was a park with a two-story bandstand in the center. In 1915, this five-story, "flat-iron" building was completed. In the Oil Boom days, the building housed over 100 lawyers. 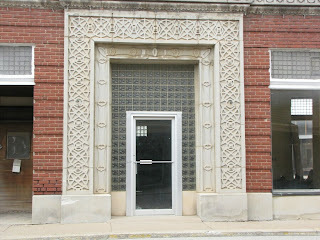 One of the main doors of the Triangle Building showing the early influence of Art Deco ornamentation that would become so popular in Tulsa. 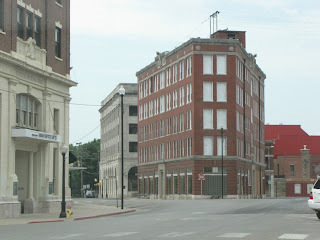 Unfortunately the building is vacant as is much of downtown Pawhuska. Perhaps better days will come. 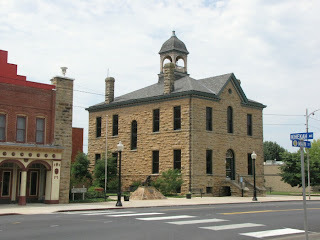 The City Hall is located in the building which was the first Osage Tribal Council House. The present stone building, built in 1894, is the second building, as the original was destroyed by fire. The bell in the tower was used to call councilmen to meetings. Also of interest in Pawhuska is the Osage Tribal Museum. It is the oldest, continually operated tribal museum in North America. 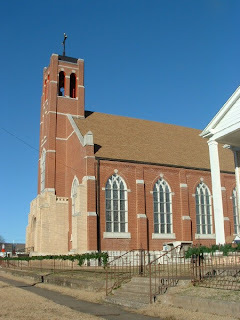 The Immaculate Conception Catholic Church in Pawhuska, Oklahoma is known by many as "The Cathedral of the Osage." Perhaps it has been given this title not only because of its large cathedral-like appearance, but also because of its importance in the life and history of the Osage. This historic church will be the subject of a separate post. 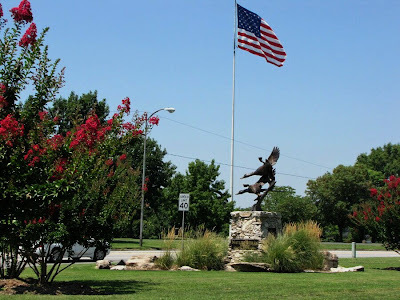 America's first Boy Scout troop was organized in Pawhuska. The troop is still active and just celebrated it's 100th anniversary. The first boy scout troop in America was organized in Pawhuska, in May, 1909, by Reverend John F. Mitchell, a missionary priest from England sent to St. Thomas Episcopal Church, by the Church of England. Rev. Mitchell, who had been associated in scout work with Lord Baden-Powell in England, organized the troop of Boy Scouts under English charter, and equipped them with English uniforms and manuals. I have always liked Pawhuska. It has a rich history. It is a community which was not able to live up to its earlier expectations. 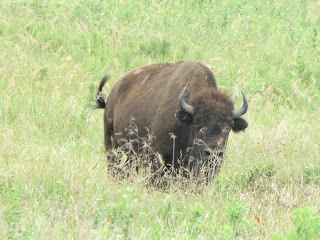 A short drive north of Pawhuska, Oklahoma is the Tallgrass Prairie Preserve. Before pioneers came to the great plains there were tens of millions of Bison or American Buffalo grazing in grasslands which stood 6 to 8 feet tall for as far as the eye could see. Prairies exist in areas too wet for desert yet too dry to support healthy forests. This preserve is the largest protected remnant of tallgrass prairie left on earth. Originally covering over 142 million acres in 14 states from Texas to Manitoba, urban sprawl and conversion to cropland have left less than 10% of this magnificent American landscape. 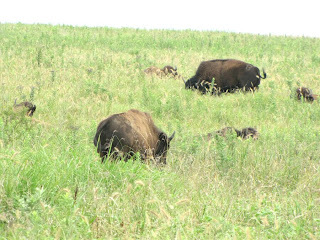 Since 1989, the Nature Conservancy has proven successful at restoring this fully-functioning portion of the tallgrass prairie ecosystem with the use of about 2500 free-roaming bison. 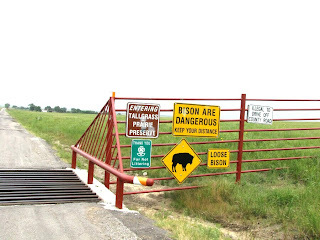 The preserve spans 39,000 acres, and bison again graze the prairie. The perimeter of the preserve is fenced and the entrances are blocked with cattle guards made of a row of railroad ties spaced a few inches apart. Cars can drive over but hoofed animals are very reluctant to cross them. There are Buffalo and Texas Longhorn Cattle who roam the area. Signs at the entrances warn to observer that these are not "tame" animals. Do not annoy the Buffalo. Verdant grassland flows over the rolling hills like green water undulating in the wind. There is a quiet majesty about this open landscape. It was a warm day (90F) and we started out with the windows closed and the air conditioner on. I rolled the window down to take some pictures and the air smelled so wonderful that we opened all the windows to breath it in. I was a moist sweet mixture of grass, wildflowers, and Bison dung. Smokey really liked it. Here and there are small groups of Bison, also called American Buffalo. Before the pioneers came these animals grazed in great herds numbered in many thousands. When they moved they looked like a wooly ocean and sounded like thunder. 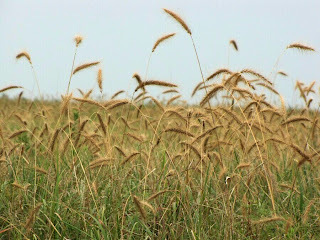 The tallgrass prairies are covered with Big Bluestem, Indian Grass, and Switch Grass growing to heights of eight feet at times. Mid-grass prairie is dominated by side-oats grama and wheatgrass, with a mixture of shortgrass prairies in dry sites and tallgrass in wetter sites. It is estimated that there were between 30-60 million bison roaming the prairies. Elk, deer, and antelope also grazed in astounding numbers. Large predators preying on the grazers included the grizzly bear and wolf. For more information on the tallgrass prairies look HERE. Susan, Smokey and I decided to take a quick break and drove up to Bartlesville, Oklahoma to rest and relax. Bartlesville is a nice town about an hour's drive north of Tulsa. We had an excellent Chinese dinner at the Szechuan restaurant and stayed in a dog friendly hotel. Today we drove over to Pawhuska, then up to the Tallgrass Prairie National Preserve which is home to a herd of Bison or American Buffalo. We took lots of pictures, and will start with Bartlesville. 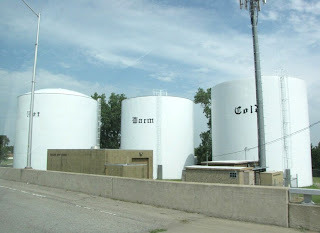 On a hill just outside of Bartlesville are three water towers labeled Hot, Warm, Cold. This is not part of a community hot water program, it is just for fun. 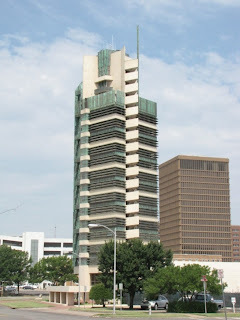 The Price Tower is a nineteen story, 221 foot high tower in Bartlesville, Oklahoma that was designed by Frank Lloyd Wright. It is the only realized skyscraper by Wright. The Price Tower was commissioned by Harold C. Price of the H. C. Price Company, a local oil pipeline and chemical firm. It opened to the public in February 1956. Bartlesville is also home to the Phillips Petroleum Company, now merged with Conoco. Frank Lloyd Wright called this masterpiece the “tree that escaped the crowded forest” when he completed it for the H.C. Price International Pipeline Company in 1956. The Price Tower is Wright’s only built skyscraper. The combination apartment-office building received the American Institute of Architects 25 Year Award and is on the National Register of Historic Places. The Price Tower Arts Center offers a variety of traveling art exhibits and permanent exhibits on Wright, Bruce Goff and the Price Company and Tower. Recent renovations by architect Wendy Evans Joseph have created an upscale 21-room boutique inn called Inn at Price Tower. With the creation of this inn, Wright enthusiasts can have the opportunity to stay overnight in a Frank Lloyd Wright building. Also on the premises is the Copper Restaurant + Bar, a fine dining experience for Bartlesville natives and visitors alike. Future plans for the Price Tower Arts Center include an expansion of their educational program. The Price Tower Arts Center has currently commissioned world-renowned architect Zaha Hadid to create the new complex that will adjoin the Price Tower, complementing the symmetrical design of Frank Lloyd Wright. 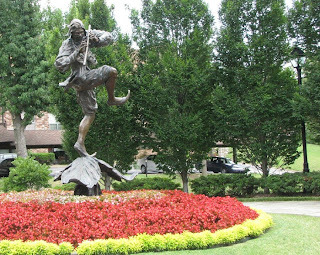 Bartlesville is the home of the annual OK MOZART International Festival, a week-long music event, each June. 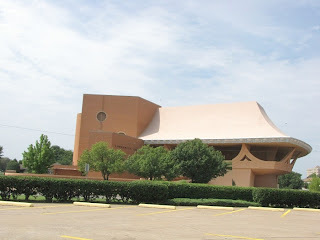 It takes place in the Bartlesville Community Center, designed by William Wesley Peters, one of Frank Lloyd Wright's students. The Bartlesville Community Center was designed by Wesley Peters, chief architect of Taliesin West–The Frank Lloyd Wright Foundation. Beautiful flowers, sheltering trees and a statue called Suspended Moment compliment the smooth curves, rounded lines and earth tone colors that make up the unusual architectural style. The exterior earth colors are continued inside the Community Center where you will find circular ramps leading to different levels and Crystalline light fixtures that are suspended like icicles from the meeting hall ceilings. An acoustically superb performance hall that seats more than 1,700 is the main focus of the Community Center considered to be “…one of the finest concert halls in this country,” said Ransom Wilson, Conductor of the Solisti New York Orchestra. Also found within is the world’s largest cloisonné artwork, a mural that is 25 feet long that depicts a stylized northeastern Oklahoma countryside. The Bartlesville Community Center is a wonderful tribute to the Frank Lloyd Wright Foundation and a must-see for any architecture fan. 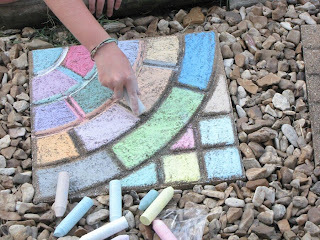 Molly and Willy decorated the stepping stones outside our back door with colored chalk - "Pastels". It will look pretty until the next good rain, which in Oklahoma July may be quite a while. 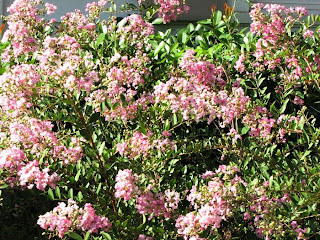 The summer after I moved to this house in Tulsa's Brookside area I planted four dwarf Crepe Myrtles across the west side of my front flower bed. That would have been early summer of 1994. When I moved into this little house it had not one single tree or shrub. Bit by bit I started landscaping the front and back. 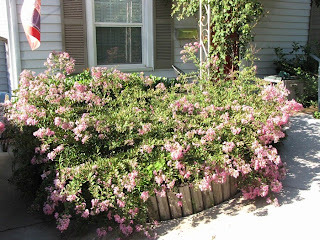 I had the idea of planting hardy perennials that would grow and bloom with a minimum of care. 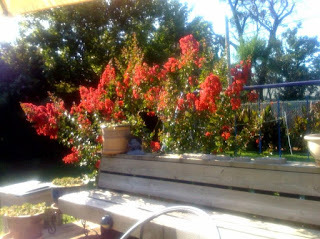 While dwarf Crepe Myrtle is not usually thought of as a bedding plant but it seemed like it would work. It had a compact growth pattern, it bloomed continuously from early summer until frost, and it is virtually indestructible. 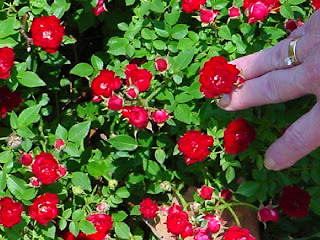 I prune it back to about 18 inches every winter and in the spring it takes off again. It has survived being moved when I moved everything around at the time we did some concrete work on the driveway and front sidewalk. I have a variety of perennials all around the place. The idea is that something is blooming all the time and nothing requires much care. McFarlin Library, the heart of the 200 acre TU campus. 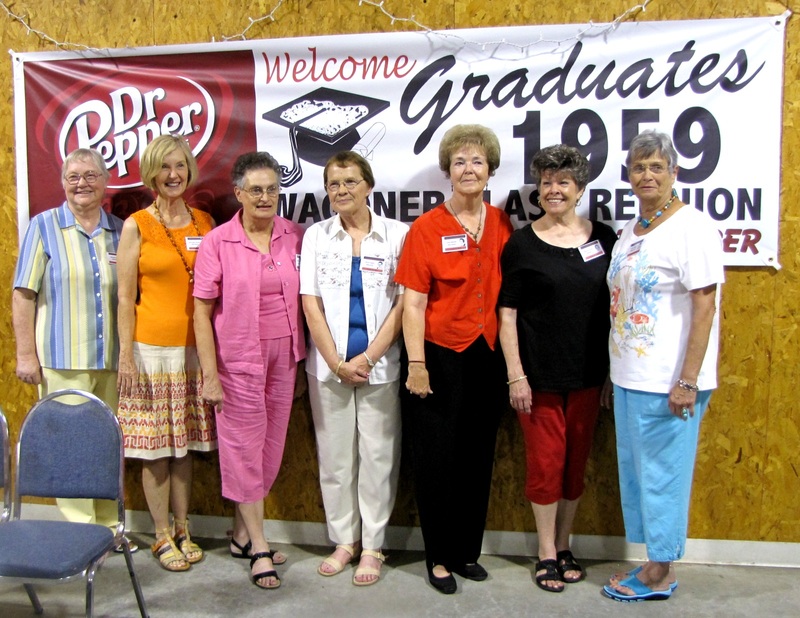 A few weeks ago I attended the 50 year reunion of my 1959 Wagoner High School graduation. I drove by the University of Tulsa today and stopped to take a photograph of the main library. It is kind of a boring story but I will tell you what I did after high school. After earning my Bachelor of Science degree at Oklahoma State University in 1964 I spent 2 years as a Lieutenant in the Army, then taught mathematics and science in the Tulsa Public School system for 3 semesters, and then began working on a graduate degree at the University of Tulsa in 1967. In January of 1968 I went to work for American Airlines as a programmer trainee and completed my Master of Science degree in January of 1972. Working out a graduate program mostly in the evening while working full time with a wife and a growing family is a very different experience than enjoying campus life as a single undergraduate. Being a college student at OSU was a lot of fun. Graduate school at TU was a grind. I enjoyed the classes but there was no partying. 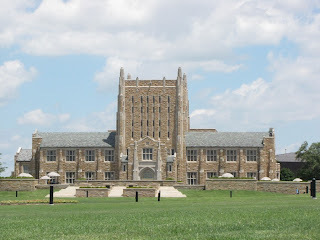 The University of Tulsa is a private university located about 2 miles east of downtown Tulsa. Established in 1894, it provides undergraduate, graduate, and professional education of the highest quality in the arts, humanities, sciences, business, education, engineering, law, nursing, and applied health sciences. The current enrollment is 4,192 of which 3,049 is undergraduate, 1,143 graduate and law. Smokey sends you greetings and best wishes. I was driving around taking pictures this afternoon when I discovered this wonderful tree. 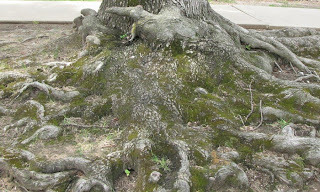 Actually what was wonderful was the root that had grown up out of the ground between the street and the sidewalk. This is on 16th Street between Rockford and St. Louis. 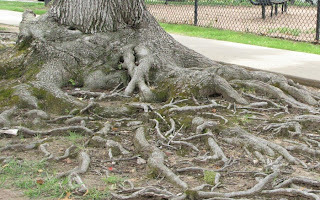 I could just imagine all sorts of wee creatures making their home in the nooks and crannies. There is a whole landscape here. According to the legend of the Irish Saint Bride (Saint Brigid) she was miraculously carried by angels to Bethlehem to attend the nativity of Christ. Scenes from the life of Christ decorate the angel's robes. They are led by seagulls and an otter. That Saint Bride lived 600 years after the birth of Christ did not bother the Celtic mind in the least. I really like this picture. This painting was on the cover of the book on Celtic Spirituality by J. Philip Newell we used for our Journey in Faith study at Christ Church last spring. The Harwelden Mansion is the former home of Mary and Earl Harwell built in 1926. It is now home to the Arts and Humanities council of Tulsa. On its grounds are two sculptures. 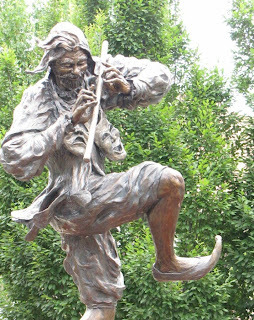 The first is a handsome and whimsical figure playing a flute. He is dancing and has a pair of drama masks hanging around his neck. Clearly he represents the performing arts. He also looks like he is thoroughly enjoying himself. The other is the Arts and Humanities version of the Tulsa penguin. 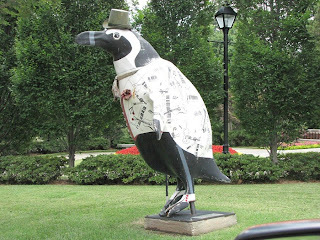 About 10 years ago the Tulsa Zoo raised money for a new penguin exhibit by selling a number of 6 foot tall white fiberglass penguins to various businesses, churches, and individuals to decorate as they wished. Later many of them were auctioned off to raise more money for the zoo. First there were Cows in chicago and New York, Pigs in Seattle, Horses in Rochester, and now Penguins in Tulsa. There should be pictures of all them somewhere on the internet but I couldn't find it. You can see some of them HERE. or search google images HERE. The container with Lyman's ashes rests on the center of the altar table between his childhood photographs. Sorry for the poor quality, all I had was my iphone. As most of you know, I am a recovering alcoholic and attend AA meetings on a regular basis. The particular AA group I usually attend meets in the Fellowship Community Church Monday through Saturday at noon. Lyman was the gentleman who started this particular AA group 15 years ago. 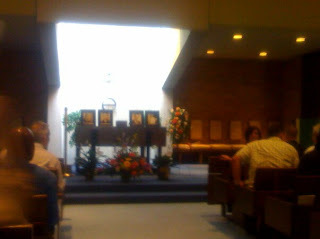 He passed away earlier this week and a memorial service was held for him this afternoon at the church. A lot of people came. Lyman was a faithful servant. He came early every day to set up chairs and make coffee. Over the years he sponsored hundreds of recovering alcoholics and encouraged many more. AA was Lyman's religion and the coffee bar was his altar. The group grew over the years and now it is not unusual to have 50 or 60 people at a meeting. The coffee never ran out and many insisted it was the best coffee anywhere. We called it Lyman-aid. Lyman was born with Cerebral Palsy and walked and spoke with some difficulty. His parents were told at birth that he would be unable to walk but he taught himself to walk anyway. He worked, he married and had children. He carved out a good life for himself but found himself dependent on the comfort of alcohol. I don't know the details of that part of his life but whatever happened, he made a new life for himself that centered around Alcoholics Anonymous. I just know that he was always there, there was always coffee, and whoever came was made to feel welcome. At the service today the pastor of our host church shared some of Lyman's history. He was born July 1, 1942 and died July 14, 2009. He talked about Lyman's service and told some stories about him. Then people were invited to share something if they wanted. Lyman generally didn't have a lot to say but had a dry sense of humor. He was thin with white hair and almost always had a smile on his face. As an example here is one story. Because of his palsy he moved and spoke in a rolling but deliberate way. At every meeting a basket is passed and most people toss in a dollar. This is what the group operates on for rent, coffee, whatever. The money is counted, put into an envelope and someone, usually Lyman, drops it off at the drive through teller at the bank. One day Lyman took the proceeds from several days and gave them to a pretty young girl who appeared to be rather new. She spent several minutes counting all the one dollar bills and appeared to be puzzled by so many bills. Lyman offered an explanation in his terse way. "I'm a lap dancer". Lyman was cremated and his ashes will be placed in the columbarium at Fellowship Church on the row closest to where our AA meetings are held. In that way, he will still be with us. School will resume in about one month. Willy will be in the fourth grade and will attend Orville and Wilbur Wright Elementary. The school is right in our neighborhood and he should be able to walk to school as soon as he and his mom are sure he knows the way. 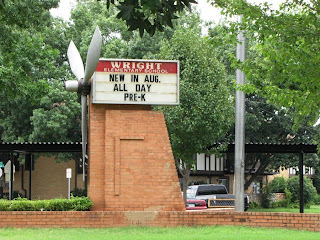 The school is named for the Wright Brothers who invented the 1903 Wright Flyer, the world's first successful airplane. The school is built on a circular design like the path of an airplane propeller. Out in front stands a real propeller on the school marquee. The 1903 Wright Flyer made four flights at Kitty Hawk, North Carolina, on December 17, 1903, the best covering 852 feet in 59 seconds. It was the first heavier-than-air, powered aircraft to make a sustained, controlled flight with a pilot aboard. 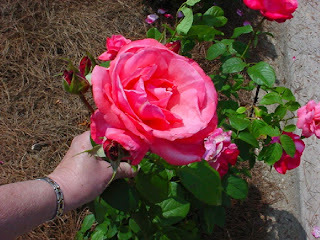 The school's motto is "Look to the skies"
...to hybrid tea roses the size of a saucer. When the high temperature gets up to 104F (40C) the little water park at 41st and Riverside is a popular spot for kids looking to cool off. Susan took Molly and Will there for a splash and they had lots of company. This part of the Riverpark was completely remodeled during the past year thanks to corporate sponsorship by Quik-Trip the chain of ubiquitous convenience stores. They are good stores, they have most everything you need, and they are open 24 hours a day. 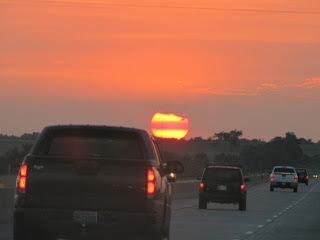 When we drove home Saturday after the reunion we enjoyed a beautiful sunset. 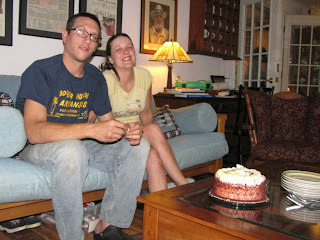 Today is my youngest son Luke's 30th birthday. Luke and his girlfriend Cara came over for dinner. I grilled some nice ribeye steaks and made Luke's favorite curried rice dish. Sue had a nice Red Velvet cake and ice cream. 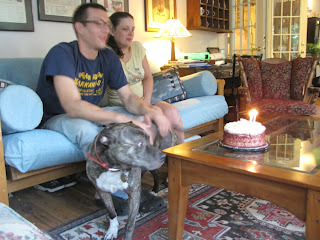 Smokey got some good steak trimmings and would like to have a slice of cake. Usually when you see a picture of Luke we are eating one of his breakfasts at the Blue Dome Diner. Today it was our turn. Happy Birthday Luke. I planted these last spring and they are looking good. There are five of them around two sides of the deck and I will try and let them grow tall enough to make an arbor around the deck. I am admiring them as I sit out on the deck grilling steaks for my son Luke's birthday. 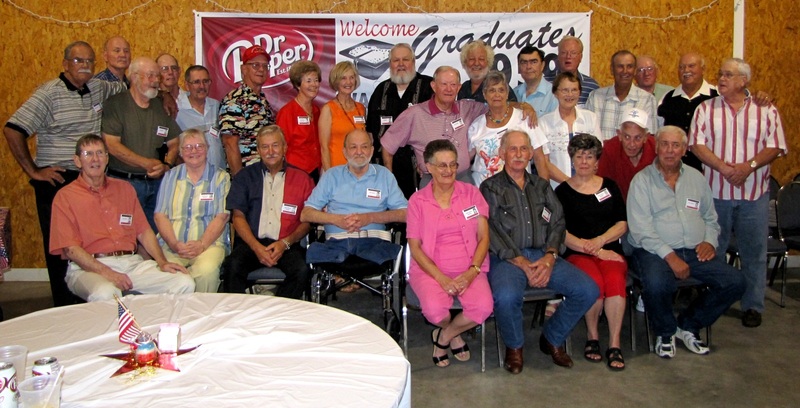 The Wagoner High School class of 1959 enjoyed a 50 year reunion. 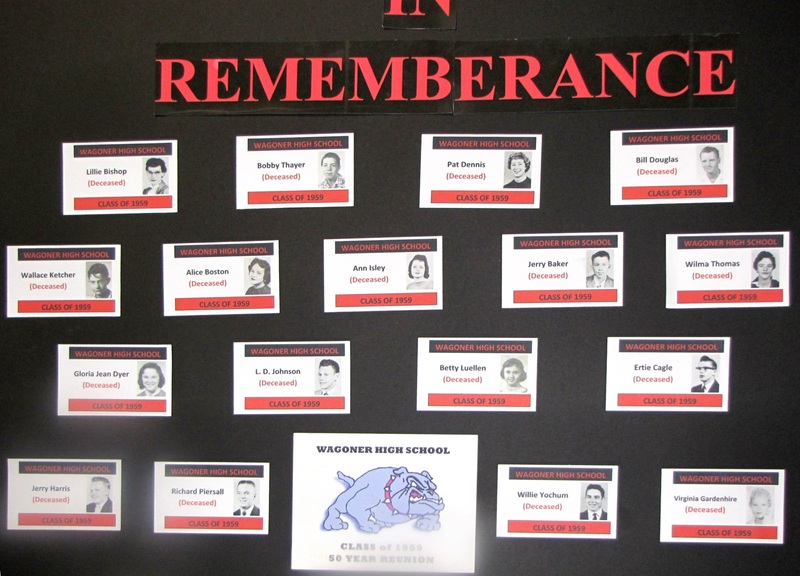 Each of us had a name tag with our name and high school yearbook photo. Of course none of us had changed a bit. 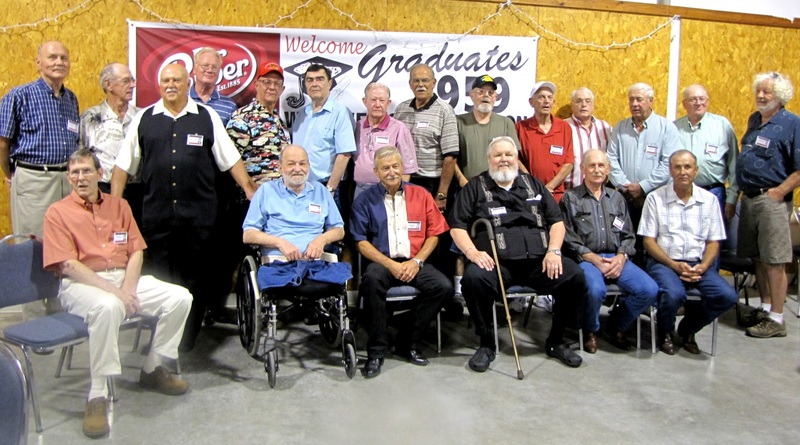 Out of a class of 60 there were 28 of us who returned after 50 years. Sadly, 17 of us have passed on. They were not forgotten.